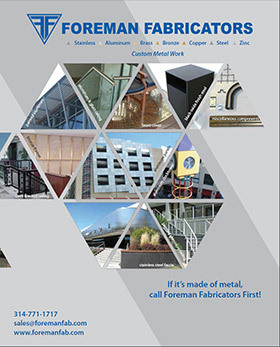 Award-Winning Steel Desk - Foreman Fabricators, Inc.
Paradowski Creative came to Foreman Fabricators with a special design for a very unique and unusual desk for its company president. 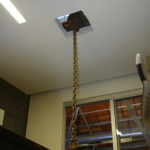 They wanted a minimalist design that tied into the building’s past as a manufacturing facility. 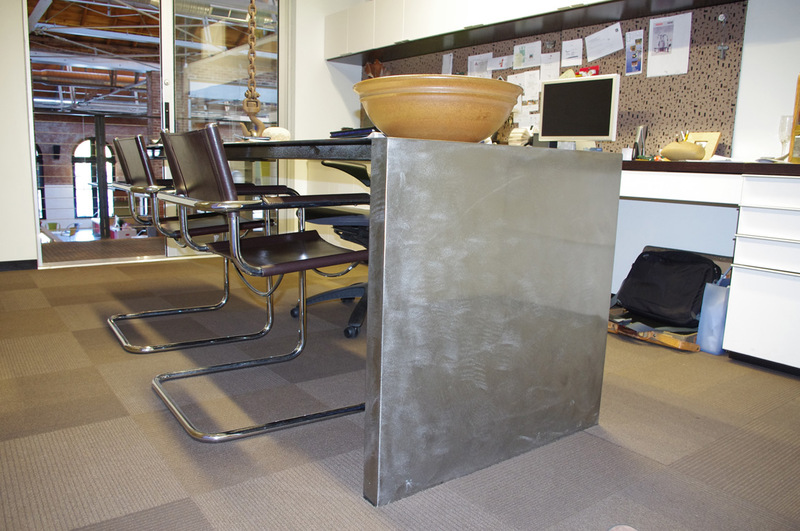 The concept proposed by Paradowski Creative was a simple desk with a surface area made of 1/8” thick plate steel that was turned down on one end to act as one of the desk legs. 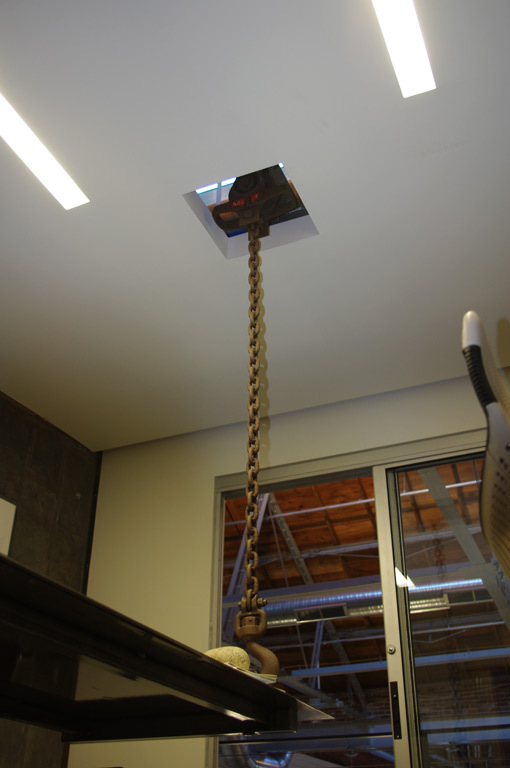 The other end of the desk was to be supported by a steel chain and anchor hook suspended from the ceiling. The whole thing was to have a rusty finish covered with lacquer. The original design concept was made to spec for the customer, but proved less stable than desirable. 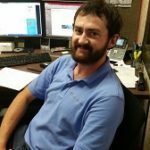 Foreman invited the customer to its shop to review some suggested changes to improve the stability of the desk, including adding structural support underneath the desktop and on the turned down leg. 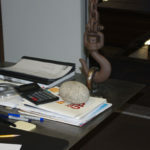 Foreman also suggested welding the anchor chain links stiff to eliminate swinging and to prevent the desk from wobbling. While at the shop, the customer also decided he wasn’t happy with the finish he chose, especially where the welds had been made on the metal sheet. After consulting with Foreman Fabricators, the customer decided he wanted the desk top to have a brighter cleaner look, which Foreman achieved by sanding and polishing the metal, then finishing it with lacquer. 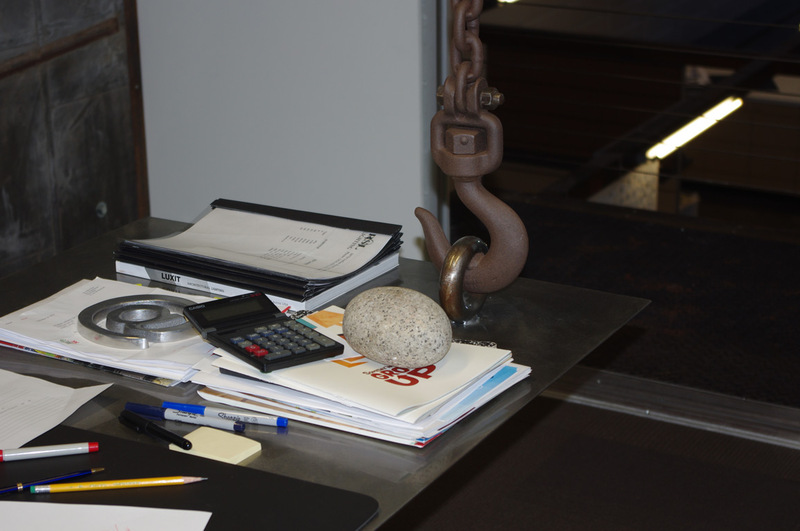 The oxidation and rust finish remained on the suspension chain, creating a nice contrast, and retaining the customer’s original vision to have the piece look rustic and oxidized from age. By working together with the customer and remaining flexible to his changing wants and needs, Foreman was able to produce a finished product that everyone was delighted with, and serves as a unique, one-of-a-kind conversation piece. 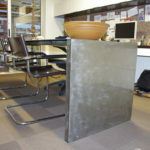 We’ve won the 2011 Silver Award for Furniture & Accessory Fabrication in the annual Ernest Weimann Top Job Competition!